Just when you were finally done with work for the day, a stranger comes knocking loudly at your door. When you answer there's no one... no one except a helpless baby abandoned on your doorstep. You follow after the stranger, hoping to find some answers but are drawn into a mystery that beckons you into a castle-like mansion. Who does the baby belong to? Why were you chosen? 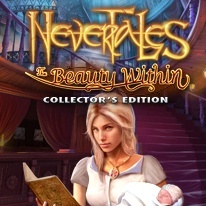 The answers will surprise you in Nevertales: The Beauty Within Collector's Edition, a page-turning Hidden Object Puzzle Adventure game!